The Life of a Refugee is the topic of my New York Times interactive for English Language Learners. Students have to put several “scrambled” sentences in the correct order and then determine what sentence would be the most appropriate next one. “The United Nations General Assembly designated June 20 as World Refugee Day to recognize and celebrate the contribution of refugees throughout the world. Since then, World Refugee Day has become an annual commemoration marked by a variety of events in over a hundred countries. I don’t have time right now to do a thorough job of compiling resources, but, especially since many of our English Language Learner students are refugees, I felt like I needed to post something about the day. ESL Holiday Lessons has a English Lesson Plan on World Refugee Day that provides audio support for the text and has an online activity. Against All Odds is an online game created by the United Nations refugee agency. In the game you play the role of a refugee in various scenarios. It’s probably accessible to high Intermediate English Language Learners. The UN has a number of good videos on refugees. Unfortunately, most are on YouTube and will be blocked by school content filters (See The Best Ways To Access Educational YouTube Videos At School). The Road To Refuge is a BBC presentation on the plight of refugees around the world. It has a substantial amount of resources on the site. The link in post connects directly to a slideshow accessible to English Language Learners that highlights refugees from different parts of the globe. Al Jazeera, the Arabic TV network, has a feature on Hmong refugees in Thailand. Pakistan’s Invisible Refugees is a slideshow from The New York Times. Children In Pakistan is a series of photos from the Boston Globe’s Big Picture. TIME Magazine has a slideshow titled The Urbanization of The World’s Refugees. CNN has many refugee-related videos. The Guardian has a graphic on refugees in the world. ABC News also has many refugee-related videos. After The Violence In Kyrgyzstan is a Wall Street Journal slideshow about the same tragedy. Ethnic attacks in Kyrgyzstan is a series of photos from The Boston Globe’s Big Picture. Faces of the displaced is a series of photos from The Boston Globe’s Big Picture. They’re of refugees fleeing the violence in Libya. Flight and Expulsion is an impressive interactive map showing the refugee flow from and to all parts of the world. You can go and check it out directly, or you might want to read and see short description from Fast Company first. The World’s Largest Refugee Camp Turns 20 is a series of photos from The Atlantic. is a new video I’m adding to the list. It’s called “Lost and Found” and has closed captioning. Dark Passage is a Newsweek slideshow. Immigration is the title of a Boston Globe series of photos. Photo Essay: Syrians Escape to Turkey is a photo gallery from The PBS News Hour. Here is a special photo presentation recognizing sixty years of the United Nations Refugee Agency. UN report on refugees – in pictures is from The Guardian. Inside the U.N.’s Shocking New Report on Refugees is from The Atlantic and has some accessible charts. Slide Show: The World’s Biggest Refugee Hot Zones comes from The PBS News Hour. Haven and Hell: The World’s Largest Refugee Camp. Dadaab: the largest refugee camp in the world — audio slideshow is from The Guardian. Exile Without End: Palestinians In Lebanon is a photo gallery from the CBC. World Refugee Day 2012 is a photo gallery from The Boston Globe. Portraits of Refugees Posing With Their Most Valued Possessions is an extraordinary photo gallery. UN warns of worst refugee crisis in nearly 20 years is from The Guardian. Where Are the 50 Most Populous Refugee Camps? is an interactive map from Smithsonian Magazine. 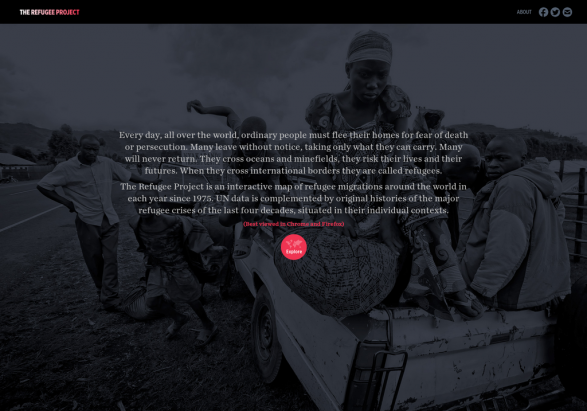 A Refugee Camp On The Web is an interactive from Doctors Without Borders. Syrian Refugees Struggle at Zaatari Camp is an interactive from The New York Times. Two years on – Syria’s refugee crisis is an interactive from alJazeera. World Refugee Day 2013 is a photo gallery from The Boston Globe. The Guardian has published an excellent infographic titled What happened to history’s refugees? Every registered refugee since 1960: interactive map is from The Guardian. The Historic Scale of Syria’s Refugee Crisis is an impressive interactive from The New York Times. The refugee challenge: can you break into Fortress Europe? – interactive is from The Guardian. It’s done in the mode of a “Choose Your Own Adventure” game. Where would 8.8 million displaced Syrians fit? is from Al Jazeera. Syria crisis: Uplifting letters of hope is from The BBC. How to teach … Refugee Week is from The Guardian. World Refugee Day Videos comes from The UN. World Refugee Day 2014 also comes from the UN and has multimedia resources. There Are More Displaced People In the World Than Any Point Since World War II is from The Atlantic. Refugees at Levels Not Seen Since World War II is from The NY Times. World Refugee Day 2014 is a photo gallery from The Boston Globe. How America’s refugee population has changed over time is an infographic from The Washington Post. Over Under Sideways Down is an interactive online comic strip about refugees, created by the Red Cross. Syrian Journey: Choose your own route is a new BBC interactive where online users simulate — in an obviously detached way — the decisions a Syrian refugee has to make. It uses the framework of old-style “choose your own adventure” simulations. Refugee Republic is an interactive about a refugee camp. Migrant Journeys is an AP interactive. How to teach … about refugees is from The Guardian. The Global Struggle to Respond to the Worst Refugee Crisis in Generations is an impressive interactive from The New York Times. Migrants Journey from Syria to Sweden is a Guardian interactive. Fleeing by the Millions: Migration Crises Around the World is as photo gallery from The Atlantic. An Interactive Map Of Every Refugee In The World is from Fast Company. Mapping Displaced People Around the World is from National Geographic. Violence Has Forced 50 Million People From Their Homes is from The Atlantic. The UN Refugee Agency has an amazing interactive. Fifty Most Populous Refugee Camps is an interactive map. 60 Million People Fleeing Chaotic Lands, U.N. Says is from The New York Times. New U.N. report says world’s refugee crisis is worse than anyone expected is from The Washington Post. The Washington Post has an interactive about a Syrian family’s journey. The Flight of Refugees Around the Globe is a NY Times interactive. 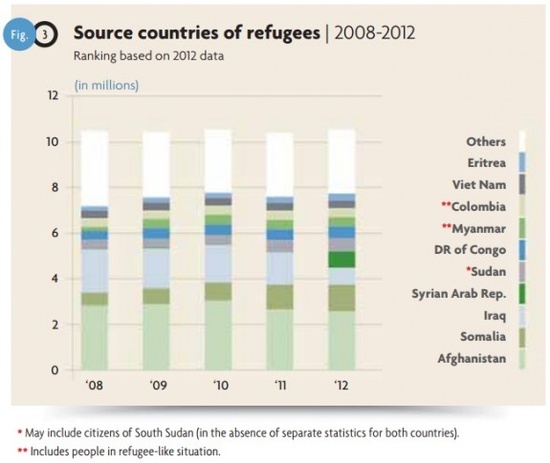 This song was generated using refugee data from the United Nations from 1975 to 2012. The quantity, length, and pitch of the song’s instruments are controlled by the volume of refugee movement and distance traveled between their countries of origin and asylum. Migrant or Refugee? There Is a Difference, With Legal Implications is from The New York Times. What do you call a person who moves to another country in search of a better life? is from The Guardian. The battle over the words used to describe migrants is from The BBC. Passport, lifejacket, lemons: what Syrian refugees pack for the crossing to Europe is from The Guardian. The Global Refugee Crisis, Region by Region is from The New York Times. Desperate Crossing is an impressive interactive from The New York Times. The Boat is an online interactive novel. You can read more about it here. Al Jazeera has a useful collection of resources on the Syrian refugee crisis. Refugees in Europe – then and now is from The Guardian. Great uprootings: Photographs of the world’s most massive migrations is from The Washington Post. Making Sense Of The Worst Refugee Crisis Since World War II is from Dogo News. Searching for Safety: The Refugee Crisis in Europe Explained in comic form. Border Challenges: Responding to the Global Migration Crisis is a lesson plan from The New York Times Learning Network. The New York Times has their own virtual reality story on refugees: The Displaced: Introduction. Refugees: That Time Everyone Said ‘No’ And Bolivia Said ‘Yes’ is from NPR. Welcomed to Europe is a photo gallery from The Atlantic. The Refugees Who Come Alone is from The Atlantic. A perilous journey: Khalid’s flight to Europe from Syria – an illustrated account is a “comic book” from The Guardian. Uncertain Journeys is an interactive from The NY Times. Thousands of Migrants Are Crossing the Balkans on Foot is a photo gallery from The Atlantic. How Refugees Make It In America is from Five Thirty Eight. What Responsibility Do We Have to Take In Refugees From Global Humanitarian Crises? is from The New York Times Learning Network. People of Nowhere from Lior Sperandeo on Vimeo. A visual guide to 75 years of major refugee crises around the world is from The Washington Post. Photographing the Refugee Trail by Drone is from The New York Times. Picturing the New Americans is from The Atlantic. Zaatari’s children: life in a refugee camp – picture essay is from The Guardian. The stunning scope of the world’s refugee crisis, in charts is from Vox. SANCTUARY WITHOUT END: THE REFUGEES THE WORLD FORGOT is a CNN interactive. Two Billion Miles is a very impressive interactive from Channel 4 in Great Britain. Other suggestions are, as always, welcome. The Waypoint, from the Washington Post, is an amazing interactive published today. It examines the journey of refugees to the Greek island of Lesbos, and is a pretty impressive piece of work. I think it would be an ideal tool to open just about any lesson on refugee crisis. Where Does Fear of Refugees Come From? is from The Atlantic. Australia’s Controversial Migration Policy is from The Atlantic. ‘Refugee’ exhibition spotlights plight of refugees in Europe and beyond is from The L.A. Times. Photography Pulitzer for Coverage of Refugee Crisis is from The New York Times. Putting a Humane, Dignified Face on Refugees is also from The NY Times. How Europe is punishing migrants is from The Washington Post. The Refugee Crisis, Through a Refugee’s Eyes is from The Atlantic. Here’s a Refugee Poster Project lesson plan from the British Council. Celebrating Refugees is from The British Council. The world’s least developed countries are also the ones hosting the most refugees is from Quartz. Refugees, Displaced People Surpass 60 Million For First Time, UNHCR Says is from NPR. A Refugee Record is from The Atlantic. A Tale of Two Brothers is a good lesson from The British Council. Here’s a poster project one teacher did in class. A Tour of Five Refugee Camps is from This American Life. Trump jr: Think of refugees like Skittles. The Uprooted is a useful interactive map demonstrating the extent of today’s world refugee crisis. The Syrians Next Door is from TIME. UNHCR Goodwill Ambassador Cate Blanchett was joined by actors Keira Knightley, Juliet Stevenson, Peter Capaldi, Stanley Tucci, Chiwetel Ejiofor, Kit Harington, Douglas Booth and Jesse Eisenberg, and writer Neil Gaiman, to perform a spoken word poem in support of the #WithRefugees campaign. The film is based on a rhythmic poem entitled ‘What They Took With Them’ by Jenifer Toksvig. Jenifer was inspired by stories and first-hand testimonies from refugees forced to flee their homes and items they took with them. REFUGE | Human stories from the refugee crisis from Magna Carta on Vimeo. A Joyful Bustle to Get Ready for Guests: Syrian Refugees is from The New York Times. Finding Home: Their families fled Syria. They were born refugees. What will happen next? is from TIME. What Does It Mean To Help One Family? is from The New York Times. Teaching About the Syrian Refugee Crisis looks very good. Living In America 101: When Refugees Arrive, What Do They Need To Learn? is from NPR. Text to Text: Comparing Jewish Refugees of the 1930s With Syrian Refugees Today is from The New York Times Learning Network. 9 questions about the global refugee crisis you were too embarrassed to ask is from Vox. 9 maps and charts that explain the global refugee crisis is also from Vox. Reality Check: The US and refugees is from the BBC. Here’s an excellent lesson on child refugees – from Film English. How You Can Help Refugees in the United States is from The New York Times. MAP: How Many Refugees Did The U.S. Let In Last Year? is from KQED. Interactive: Refugees’ Bags and Belongings is from Refugees Deeply. Where Refugees Come From is a very good interactive from The New York Times tracing where the origin of refugees coming to the United States over the past several years. a new executive order on Monday to ban all refugees from entering the United States for 120 days. The order also cuts the refugee program in half, capping it at 50,000 people for the 2017 fiscal year, down from the 110,000 ceiling put in place under President Obama. In a Refugee’s Bags, Memories of Home is from The NY Times. Somali Students Help Teachers Learn What It’s Like To Be A Refugee is from NPR. When Elmo And Big Bird Talk To Refugees is from NPR. Examining How the Syrian Crisis Has Shaped the Lives of Young Refugees: A Guest Lesson Plan is from The New York Times Learning Network. The Refugee Crisis and Human Responsibility is a new lesson plan from Facing History. United Nations High Commissioner for Refugees (UNHCR) and Google have created an interactive Searching For Syria site providing an excellent overview of the Syrian War and its refugee crisis. You can read more about it at TechCrunch. REFUGEES IN THEIR OWN COUNTRY is an NPR interactive. Desperate Migrants Risk Everything in Deadly Mediterranean Crossings is a photo gallery from The Atlantic. Ask a Syrian Girl Video Series is from Teen Vogue. These researchers just debunked an all-too-common belief about refugees is from The Washington Post. Refugees May Be Good For The Economy is from Five Thirty-Eight. The Rohingya exodus: A desperate escape is a Reuters interactive. New Neighbours: Young Refugees from Across Europe Guest Edit VICE.com is a special project at….VICE. Covering the world’s biggest hunger crises, I saw people with nothing give everything to save a life is from The Washington Post. 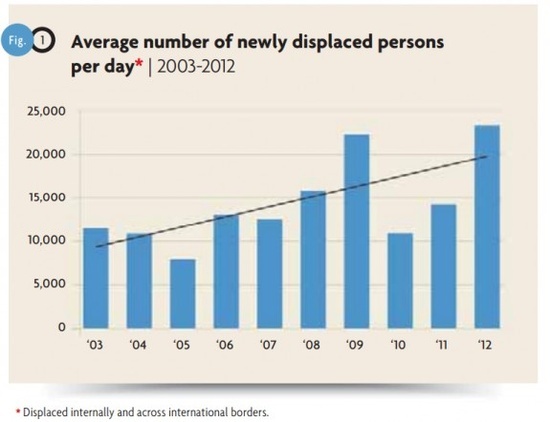 The number of forcibly displaced people grew to a record in 2016 is an infographic from The Economist. StoryCorps has several refugee stories. Bins in Berlin to ATMs in Antwerp: a guide to Europe for refugees – photo essay is from The Guardian. THE GENESIS OF EXODUS: Violence, poverty, and social disintegration: the root causes of Central American migration is an interactive map. Schools key to successful integration of child refugees, says study is from Eureka Alert. Choose Your Own Adventure games often have to be careful balancing respecting the experiences of those who are being simulated and portraying it sensitively with a social conscious. The Waiting Game, produced by ProPublica, works hard at doing the latter in simulating the experience faced by those seeking asylum in the United States. With Just His Parrot, a Refugee Boy Starts a Hard New Life is from The NY Times. Memories Lost and Futures on Hold: A Look Inside a Camp for Syria’s Displaced is from The NY Times. SEEKING REFUGE FOR MY CHILDREN is a bilingual (English/Spanish) interactive. Refugee Flow tracks the flow of refugees through a 3-D visualize of the world. You can read more about it at Google Maps Mania. Visual Learning: Dire Straits is a lesson from YES Magazine about refugees. Refugees: Using Comics to Foster Understanding is by Sarah Cooper. If you found post useful, you might want to look at previous “The Best…” lists and also consider subscribing to blog for free. That’s a fantastic list, we missed two of them ourselves. Thanks for this. Would you also be able to mention that Microsoft are donating $1 for every person who joins http://www.causes.com/refugee. They are also matching any donation made. You might also be interested in these slideshows by the duckrabbit team about the life of internally displaced people in Kenya. Great resource this by the way.